This is a followup to last week’s post What LIGO Proved. If you haven’t read that yet, you should check it out. It was more of an intro to the topic, but this week we’ll get into the technical details. The detection of gravitational waves could rank as one of the top scientific discoveries of all time. And as I speculated last week, LIGO will almost certainly take the Nobel Prize in Physics for 2016. We’ll start with a closer look at the signals detected. 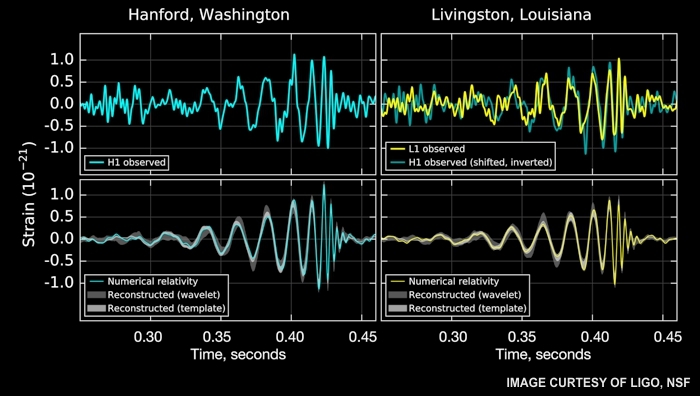 The top graphic shows signals received by the two LIGO detectors, one near Hanford, Washington, the other near Livingston, Louisiana. The two detectors are 3002 km (1865 miles) apart for good reason. If both detectors receive the same signal, it virtually guarantees that signal was real. Otherwise, the signal could be an artifact of electronics or programming or local terrestrial vibrations. The top row shows how both signals appear almost identical. The bottom row shows what the signal was predicted to look like using a super-computer simulation based on General Relativity. What they were detecting and simulating was the merger of two black holes. Everything matches so well that LIGO researchers are convinced they observed the last moments of a binary black hole system. As two black holes orbit (accelerate) around each other, their intense gravity creates distortions in space-time that spread outward like ripples in a pond, but these waves move at the speed of light. The waves also carry away energy. You can see that the frequency keeps increasing as the objects get closer to merging. The closer they get, the faster they move — something that even Isaac Newton’s theory of gravity predicts. The amplitude of the waves also increases because of increasing acceleration. Then the two black holes merge (peak amplitude) and after a “chirp” and brief “ring down” period, all is quiet. It is informative to “listen” to this event and hear those frequency and amplitude effects. That can be done by using the same waveform to drive an audio source. Listen to some examples here (scroll down the page). By the time the waves reached Earth, the power level had dropped significantly. The LIGO detector registered a spacial distortion less than 1/1000 the diameter of a proton (≈10-18 m). To put that more into a human perspective: If LIGO stretched all the way from Earth to Alpha Centauri (4.367 light years), then the total amount of distortion would have been about the width of a human hair. It boggles the mind that we could detect such a signal, and it’s a tribute to the scientists and engineers who built LIGO. LIGO can detect that weak signal using some very clever physics. The detector is a laser interferometer with 4 km long hollow arms. Inside those arms (which are maintained at high vacuum), laser beams are bouncing between mirrors mounted at each end. If either arm is distorted by a fraction of a wavelength of light, the combined beam output will be modulated by constructive or destructive interference. That distortion is what they were looking for, what they found, and what the top graphic shows. One cannot easily visualize gravitational waves — they are not at all like waves on water. They stretch space itself in 3D, as well as anything embedded in that space. And they move at the speed of light, unimpeded by any entity in the cosmos. But we now know they are real, and behave as predicted by Einstein in 1916. It is fitting the discovery was made on the centennial of his publication.